If you're competing and showing your horse, you can use Equinety right up to the days leading up to your competition, during and after your competition. You can use Equinety during quarantine. Equinety helps to repair and regenerate the cells in your horse and since your horse is made up of about 70% in protein, giving your horse amino acids are ESSENTIAL. When you horse eats protein, the body has to break the proteins down into amino acids. THEN, the body takes the amino acids and rebuilds then back into the necessary proteins it needs. Since Equinety is already in the amino acid stage, all the body has to do is absorb the amino acids. 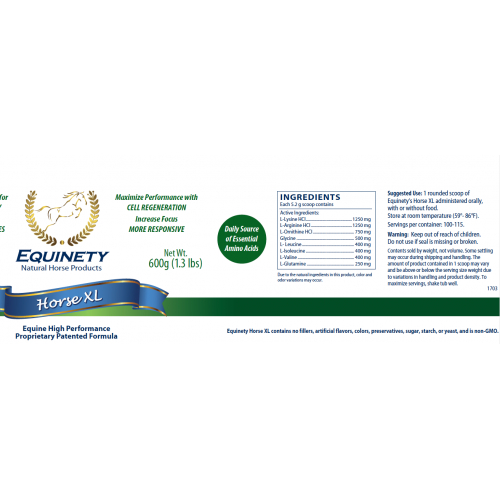 Each tub of Equinity’s Horse XL provides a 3 month supply of formula for each horse when taken as directed. This set of images is from a horse who presented with constant and reoccurring abscesses, this had been going on for over 6 months. The horse was increasingly lame. The Vet and farrier had been out and both and confirmed abscess but according to testers it was located on the left side of the foot. This was a false reading. When i put thermals on the horse it showed moderate sub solar abscess with a hot point on the right side of the foot. Along with contained soaking the owner decided to try the horse on Equinety. As you can see the horse in the first 3 weeks became completely sound at all gates. He also had nice growth in his hoof wall and his frog became healthier as you can see by the reduced heat in the cleft. This OTTB mare had a very burnt and dull coat along with weight issues, ulcers, and she tends to need a lot of visits from the chiro and massage because of her growth and also competition. She is a 4 year old Barrel horse now. What you're seeing in the 2 images is very interesting. In the image showing the darker zones those are cool zones and indicate poor circulation. in 2nd image this was taken 2 weeks after starting Equinety. You can still see some darker zones but most of her body has started to really level itself out. There was no other changes in the horses routine. Formulated back in 1998 as an anti-aging "Youth Formula" for the 50+ crowd, by a British, Cambridge and Harvard educated Canadian family physician, Dr. Philip White. Then in 2006, a second label was put on the product and is now in all of Major League Baseball and Olympic athletes take the product... In 2014, we put it in a tub for horses and call it Equinety. In 2016, Equinety was the “Preferred” Horse Supplement for Equine Canada! Equinety is 100% pure amino acids... There are no fillers, no sugars, no starches and NO Loading dose! SO, what makes Equinety different than other products on the market? ONE is the particular combination of amino acids and how much of each one to make up the "stack". SECOND, instead of targeting a specific area such as joints, coat, gut, hooves, attitude, recovery etc, it's targeting the pituitary gland. THIRD, using free form crystalline amino acids which “tickle” the anterior pituitary gland, which releases the necessary hormones the body needs to help repair itself at a cellular level. With all that said, Equinety gives the body what it needs to help heal itself from a cellular level and balances the horse from the inside out! Typically in a couple days you'll notice a less stressed, less anxiety and more focused horse... going into a couple weeks, you'll definitely notice faster recovery... within 30 days you'll notice a softer, shinier coat and more muscle (you’ll also notice significant healing if there’s a wound or coming out of surgery) and 4-6 weeks, stronger and faster growing hooves. Equinety is customizing to the body and helping to make a well balanced horse!